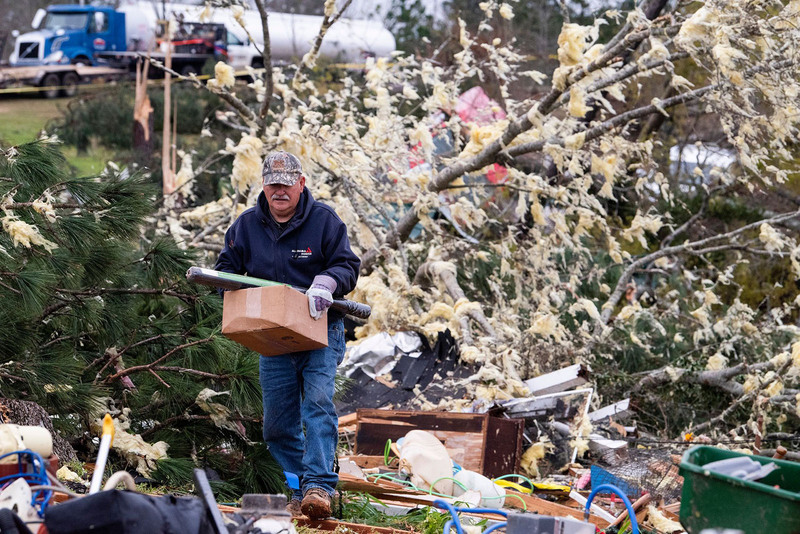 Lee County, Ala. officials are cleaning up after a tornado packing 170-MPH winds ripped through the community March 3, killing at least 23 people and injuring dozens. Preliminary reports from the National Weather Service classified the tornado as an EF-4 tornado, which are clocked at between 166 to 200 MPH. The tornado hit the county’s Beauregard-Smiths Station community. More than 100 homes were destroyed. The United States has not seen a tornado of such magnitude since 2017, according to The Weather Channel. The last EF4 struck Van Zandt County, Texas, in the northeastern part of the state. The Lee County, Ala. tornado was the deadliest since 2013, when an EF5 killed 24 in Cleveland County, Okla. The tornado was estimated to be .87 miles wide and its track nearly 27 miles across Alabama and 43 miles in Georgia, according to the National Weather Service. Lee County is now picking up the pieces and beginning the road to recovery. According to County Director of Emergency Management Kathrine Carson, emergency responders began providing immediate assistance after the tornadoes hit to fill survivors’ needs, such as providing necessary medications. “We took care of as many people as we could find in the immediate aftermath and made sure everyone had a place to go,” she said. Carson said recovery efforts are on track and may even be considered “ahead of schedule.” To aid in the recovery, Lee County Sheriff Jay Jones said multiple response units from both inside and outside the community are helping repair the damage. Jones said church groups, business groups and Community Emergency Response Team-certified responders are some of the many organizations working to clear debris. Carson said there are distribution centers in five different locations across the county where survivors can get supplies. She encourages all county members to call 211 to report any unmet needs. “If we don’t know about their needs, we can’t meet them,” she said. Individuals will be able to visit disaster recovery centers that open soon, to meet with representatives from organizations like the Red Cross and the Small Business Administration to discuss issues or file claims. President Trump approved a major disaster declaration March 4 for Lee County after Alabama Gov. Kay Ivey requested it. The declaration triggers assistance from the Federal Emergency Management Agency (FEMA) for temporary housing, home repairs, low-cost loans to cover uninsured property losses and other programs to help individuals and business owners recover. Both Carson and Jones said FEMA has been very responsive in the county. The Lee County Emergency Management Agency (EMA), United Way and the Red Cross are among the units that are in it for the long haul, Carson said. The organizations will be staying active in the area and overseeing continued recovery efforts. Jones said the biggest challenges the county faces are the cleanup efforts and responding to the needs of those who lost their loved ones or their homes. He advised other counties to have good, working relationships with partners in first response. “Establishing those relationships and being on a first name basis with individuals involved goes a long way in streamlining and providing a more efficient response should you have a natural disaster or event,” he said. Carson emphasized the importance of constructing tornado shelters in every home in case of an emergency situation. “It can happen in your hometown and we knew that before this event occurred, but it becomes way more real when it does,” she said. The local government is forever changed by witnessing the disaster, according to Carson. “It just increases out dedication tenfold to our jobs and that what we provide to the public is the best that it can be,” she said. Rachel Looker is a junior staff writer for County News. She previously worked as a web producer at WFMZ-TV in Allentown, Pennsylvania. Rachel attended Marywood University in Scranton, Pennsylvania where she received her B.A. in Digital Media with Broadcast Journalism and Production. On April 1, the U.S. Senate failed to pass a pair of disaster aid packages that would provide supplemental funding for victims of recent hurricanes, wildfires and flooding. Lawmakers voted down a $13.45 billion Senate GOP drafted package (S.
On March 13, the U.S. House Financial Services Committee held a hearing to discuss draft legislation that would reauthorize and reform the National Flood Insurance Program (NFIP). The program, which expires May 31, 2019, has received many short-term extensions since its last long-term reauthorization ended in 2017. On March 26, the U.S. House Financial Services Subcommittee on Oversight and Reform heard testimony on draft legislation to permanently authorize the Community Development Block Grant – Disaster Recovery (CDBG-DR) program. This session discusses imminent pre-hazard mitigation rule changes following the passage of the Disaster Recovery Relief Act, including funding eligibility and potential codes and standards requirements. NACo has partnered with the Institute for Building Technology and Safety (IBTS) on a new member benefit that will support disaster services for member counties.